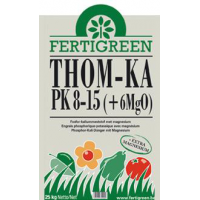 Fertigreen® Thom-ka® is a valuable fertilizer with high quality potassium and a guaranteed phosphate action. 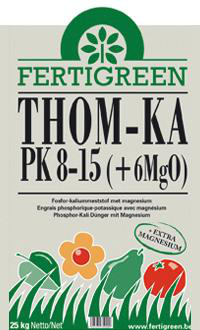 The high magnesium concentration creates a nice green lawn and plants. Apply in autumn, winter or early spring. Preferably, before the start of the excavation work, so that the optimum nutrient elements in the soil can be distributed. Nitrogen can be directed and independently applied, taking into consideration the state of crop and the weather conditions. NOTE: Although the above table was compiled very carefully, it is indicative only and may not derive any rights on the basis of the information provided.